Perfect for sharing at breakfast or brunch. Vegetarian and gluten free, this rustic recipe can also be modified with dairy free alternatives. Check out the video below! – Grate the zest of half a lemon into the Greek yoghurt. Add the juice of half a lemon and mix well. Sprinkle half the paprika mixture onto the yoghurt and set aside. – Heat up the coconut oil in a skillet then add the garlic. Fry the garlic on a high heat for 1-2 minutes, until lightly browned. – Add the spinach and mix well with the garlic. 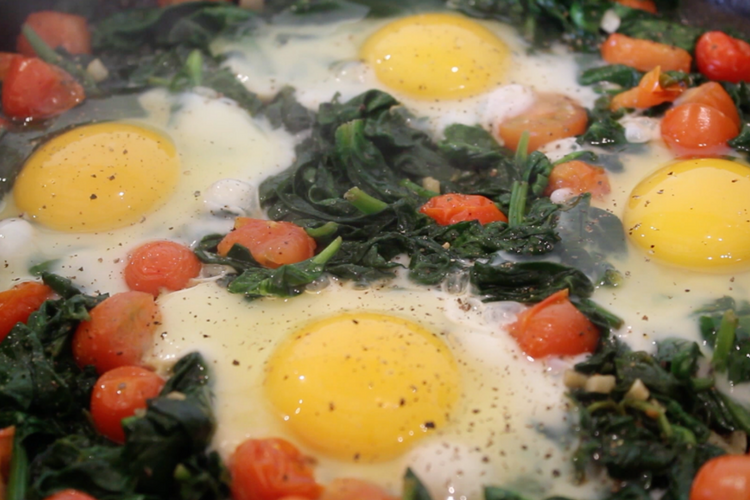 Once the spinach has wilted slightly, add the chopped tomatoes and fry for another 1-2 minutes. Drain any excess water. – Make 4 holes in the skillet, and crack 1 egg into each hole. Add salt and pepper to taste. Continue cooking on a medium heat until the eggs have set. – Drizzle a little olive oil onto the yoghurt mixture, then spoon onto the eggs. Add some more of the paprika mixture and a few chilli flakes. Serve immediately.